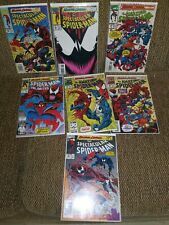 Ultimate Spider-Man Lot - 31, 32, 33, 34, 35, 36, 37, 38, 39 & 40 - 1st Venom !! Marvel's, Amazing Spider-Man Halloween Special Edition 1993 . Last One!! This page was last updated: 21-Apr 18:28. Number of bids and bid amounts may be slightly out of date. See each listing for international shipping options and costs.